There’s a scene from Walt Disney’s 1942 classic, Bambi, where the titular young deer is laying down tired, wounded, and alone as a wildfire races toward him. The Great Prince of the Forest, and Bambi’s father, calls out to him, “Get up, Bambi! Get up! 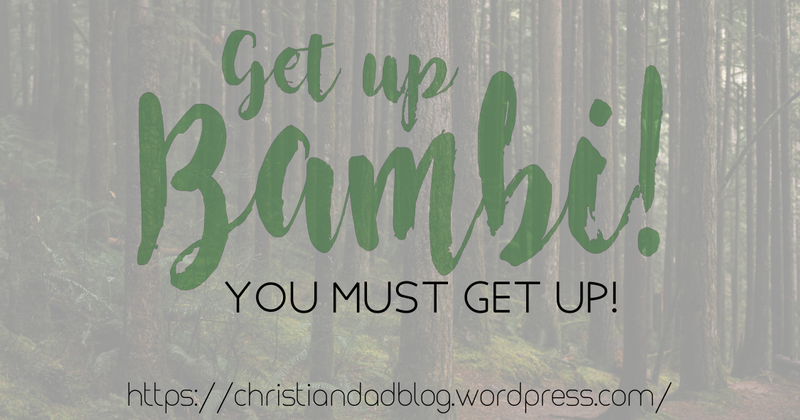 You must get up!” Bambi’s father could see what he couldn’t see for himself, the imminent danger he was in and that he would certainly die if he didn’t pick himself up off the ground and move. 1 Kings 19 shows us a picture of the prophet Elijah. He had just won a great victory in a spiritual battle with the prophets of Baal, a false Canaanite god. Queen Jezebel, the evil wife of King Ahab, heard about the defeat of her prophets and chased after Elijah to kill him! Tired, scared, and seemingly alone, Elijah took up residence in a cave in the wilderness and laid down, for good. God came to him and asked, “What are you doing here, Elijah?” Elijah explained that he was tired and that he was the only person in Israel that was still loyal to him. God told Elijah that there were at least 7,000 Israelites who were still loyal to their God, and he gave Elijah a list of things to do, including to train Elisha, his replacement. God basically said get up, Elijah! Get up! We as Christians are also warned of dangers around us. Paul warns us of false teachers, who want to destroy us from the inside. Peter warns us about the devil, who stalks us, hunting to find a person who he can devour! We may want lay down under the pressure and strain of spiritual battle, feeling wounded, lost, and alone. But we are never alone. Just like Elijah, there are those who are loyal to our God, our Christian family who we can lean on and they can lean on us. We have Jesus who we can cast our cares onto, we have the Spirit who guides us and makes intercession for us, and we have the Father who forgives us and watches over us. So get up, Christian! Get up! You must get up! There is work to do, let’s go together and do it! This entry was posted in Every Day and tagged Christ, Christian Walk, Christianity, Church, church of christ, Elijah, Get Up, Jesus, Jesus Christ, spirituality by Richie. Bookmark the permalink.